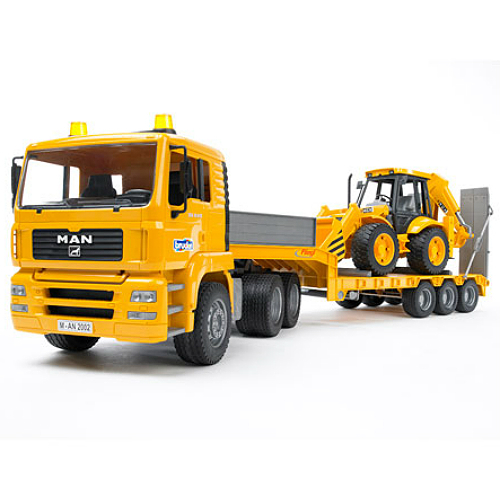 Realistic, functioning details on this 1:16 scale, Bruder MAN TGA Low Loader Truck With JCB Backhoe Loader, high quality machine lets it swivel and work just like the real ones! 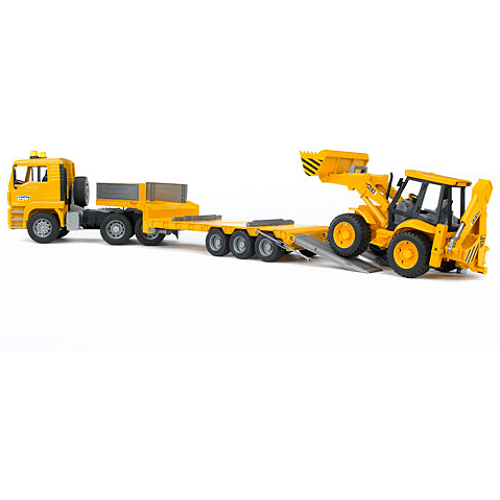 The low loader has real tread tires, folding outside mirrors, a fully functional fifth wheel coupling of the semi-trailer, folding supports and drive-on ramps. They are made of durable ABS plastic and can be used indoors or out. 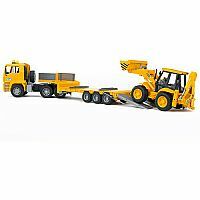 The JCB 4CX Backhoe loader can be used for frontal and rear work and the driver's seat can be rotated for this purpose. Let's get to work! Measures approximately: 33.00 x 11.00 x 8.00 inches..